Did you see Galaxy Quest? I did. And when you were watching the scene with the rock monster, were you wondering where the hell they filmed that? 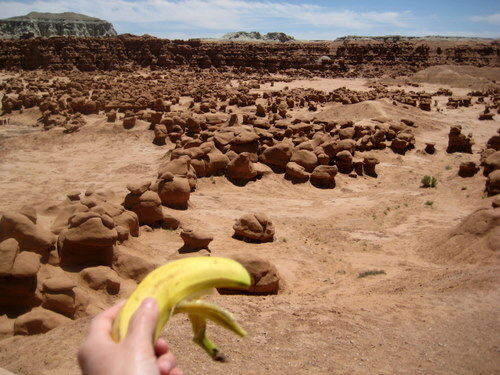 Ok, maybe it was just me, but they filmed that at Goblin Valley State Park. And ever since then, I’ve always wanted to visit. And yes, the place is truly otherworldly. Look at this weirdness, my banana says! We didn’t end up eating a proper lunch that day, just a bunch of random snacks, like bananas, apples, yogurt, fig newtons, and cookies. Perhaps this was not the best idea. 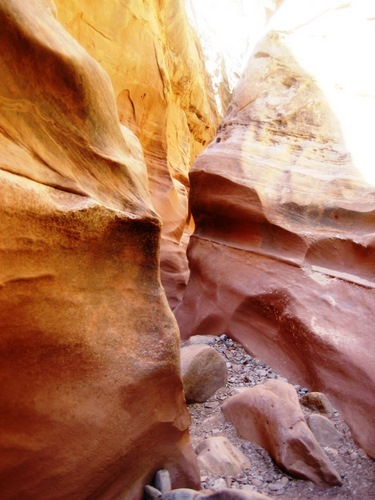 We then proceeded to Little Horse Canyon, which is just 7 miles away from Goblin Valley. This hike is the most popular hike in the San Rafael Swell, and I can see why. I’d never witnessed slot canyons before, and these were even tiny ones, but they were pretty tremendous. And it was a super fun hike. There are several good spots to rest along the way, perfect for snacking.